On the Main Line: Shadal series #4 - disapproving of R. Samson Raphael Hirsch's predilection for German. 10 plus 9? which words mean that? tzafon? None of them. It was my lame attempt at making "19" as in "Nineteen Letters" (the German title of אגרות צפון) rhyme with "Holdheim." Ten PLus Nine, Holdheim, get it? Poetic license. As a fan of both Hirsch and Shadal (and a descendant of the former), I've always been curious about any direct or even indirect links between them. The record is thin: there is Shadal's letter to Hirsch recommending his student Igel, there is Shadal's relatively brief critique of the Nineteen Letters, and now there is this cryptic little snippet (thanks, S., for digging it up). And so far I have seen nothing from Hirsch to Shadal, which is why this snippet is so tantalizing. On the whole, it seems that these two luminaries simply moved in different orbits. Dan, I'm assuming that R. Hirsch's letter was a response of some kind to Shadal's letter about Igel. As for them moving in different orbits, while this is true, there were only degrees of separation between them (although I suppose that's true for pretty much everyone). 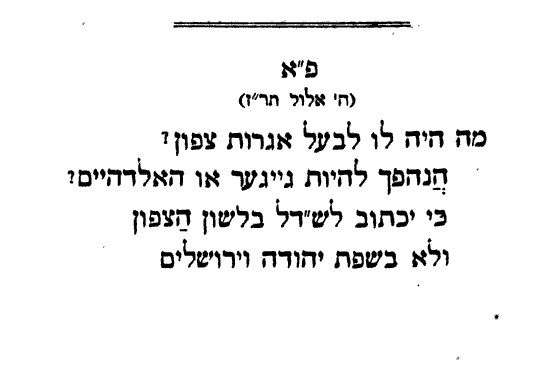 For example, Seligmann Baer's Toras Elohim has a haskamah from R. Hirsch, as well as a letter from Shadal. Zohar, at least it wasn't in German. "in eastern Europe a modern Jew was often called a דייטשער"
Shadal's letter to S.R.H. on behalf of Igel was written in August 1849, two years *after* his little rhymed complaint about Hirsch's German letter. So at least we now have evidence of an earlier direct contact between them. If Luzzatto ever replied to this letter, my guess is that he wrote (reluctantly) in German, which would explain why such a reply would not have been included in Iggerot Shadal or the Epistolario. Good point, Dan! Please be assured that when I write the book "On the Relations Between Samson Raphael Hirsch of the North and Samuel David Luzzatto of the South" I will be sure to double check the dates! What's up with the author of the Nineteen Letters? Has he become a Geiger or Holdheim? For he wrote to Shadal in German fetters. He should write in Hebrew next time! What's up with the author of the Northern Letters? Dr. Kaplan, better effort than mine! In my defense, apart for not being a poet by any means, I didn't try very hard. Maybe I should do a rewrite! In my head I keep hearing things like "There once was a man named Geiger, the criticism he practiced was higher..."